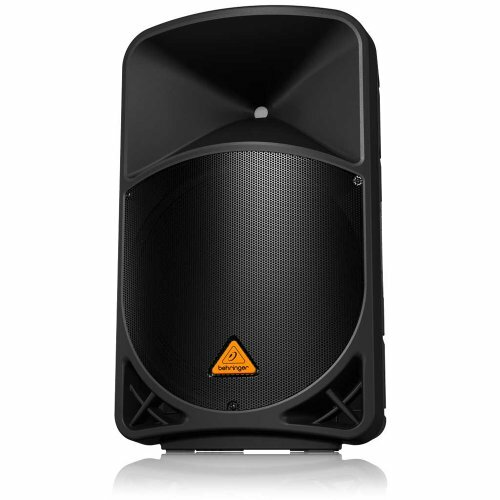 EUROLIVE B115D and B112D active loudspeakers are exactly what you’ve come to expect from Behringer – more power, more features and absolutely more affordable! Our engineers have really outdone themselves, creating two self-contained PA solutions that merge state-of-the-art, 1,000-Watt Class-D power amp technology, built-in wireless microphone capability and exceptional portability. These professional active loudspeakers are destined to become legends in its own right, alongside the other EUROLIVE models that have made Behringer the world leader in active loudspeakers. Cut the Fat; Keep the Beef. We drew from our considerable experience to build these performance-grade loudspeakers and made them lighter (B115D: 38 lbs./17.2 kg; B112D: 32 lbs./14.5 kg) and more powerful. We started with custom-engineered Class-D power amps for the ultimate in low-distortion power and efficiency. Backed by SMPS (Switch Mode Power Supply) technology, the high-tech alternative to heavy transformers and massive heat sinks, these loudspeakers can run cool all day and all night without even breaking a sweat! Wireless Wonderland. Until now, adding wireless microphones to a PA system meant either a mess of wires and dangling receivers or worse, a built-in receiver with dodgy performance and a hefty price tag. Those days are officially over thanks to Behringer ULTRALINK Series wireless mics that feature our exclusive, ultra-compact 2-channel receiver. Just plug the receiver into the dedicated wireless port on the rear panel and you have full access to two channels of supremely stable, natural-sounding wireless connectivity. Sold separately and available in hand-held or headset models, Behringer ULTRALINK Series wireless mics will immediately (and inexpensively) expand your B115D/B112D to handle virtually any live sound application. Item is Hazmat Non Returnable.